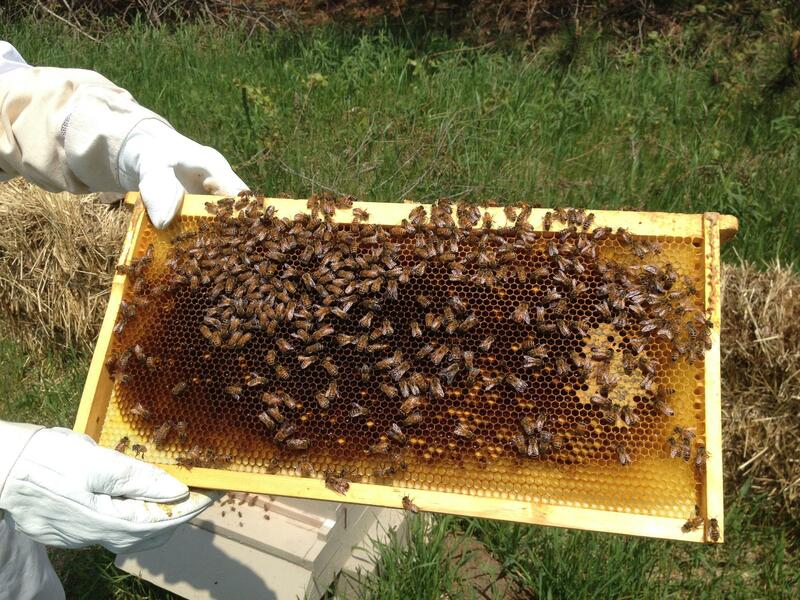 As Some Species Struggle, MSU Holds Meetings On "Pollinator Health"
Honeybees from a hive at the Pleasant Hill organic fruit farm in Fennville, Michigan. Problems with Monarch butterflies, honeybees and other pollinating insects are the theme of three events the Michigan State University Extension is holding this month. The Extension has scheduled “Pollinator Health Meetings” for March 5 in Traverse City, March 7 in West Olive and March 11 in Frankenmuth. Topics include honeybee management, habitat building, reducing harmful pesticide use and the need to learn more about Michigan’s wild bees. Pollinating insects are critical to the state’s ecosystems and fruit farming. But in recent years, some have seen an alarming drop in their numbers. Disease and other pressures have led to colony collapse among honeybees. MSU postdoctoral entomology researcher Kelsey Graham says herbicide-heavy corn and soy row cropping has affected milkweed, the host plant of Monarch butterflies. That’s a problem, she says, because Monarch butterflies build up their numbers in Michigan before they migrate south. “So we’re working to see if we can build back up these host plant populations across the state,” she said. Graham says growers and land managers can begin making changes this season, by changing pesticide use and getting a start on making land friendlier to bees and Monarchs. “Putting in habitat, that takes usually a few years to really establish. But getting going now means that you’re going to have good habitat two or three years instead of five years,” she said. Graham says building up habitat is especially important for wild bees. “We have about 465 different species of wild bee in Michigan,” she said. But, she added, right now scientists know “very little” about most of those bees and whether they are thriving, struggling or holding steady. “So one part of this project is really trying to figure out what bees do we have in the state, where they are and how the populations are doing,” Graham said. Western Michigan University will not be known as a “Tree Campus USA” this year. The decision comes after Western cut down about 60 trees amid student and faculty protests last fall.